Vitamin C Serum is used topically as a skin care product and provides a number of different benefits for your skin including evening skin tone, reducing the appearance of fine lines and wrinkles, tightening your skin, encouraging collagen production and more. But most people wonder if Vitamin C serum is good for acne prone skin. Here is some information that will help you decide if Vitamin C serum is good for acne prone skin and what is the best vitamin C serum to use. How Does Vitamin C Serum Help Acne? Vitamin C serum is good for acne prone skin since it rids the skin of excess oil and dirt unblocking pores and keeping them oil and dirt free. It also helps fight inflammation, fighting the soreness and swelling of acne. In addition, it promotes healing of any type of injury or acne helping to heal acne breakouts faster and more effectively as well as preventing some acne scarring. And since Vitamin C serum lightens dark spots and evens skin tone, it helps to promote the healing and lightening of acne scars. It may take some time, but vitamin C serum is excellent for acne prone skin especially when combined with other skin healing ingredients. Does Vitamin C Serum Cause Acne Breakouts? Some people do experience acne breakouts when first beginning to use a Vitamin C serum. The cause of these breakouts are due to the fact that vitamin c brings dirt and oil that is in your skin’s pores to the surface, which can result in an acne breakout or two until the pores are completely cleared out. However, people who continued to use Vitamin C serum found that their skin resulted in clearer and healthier skin over time and fewer acne breakouts. Patience may be required in order for you to see the end of those acne breakouts. When using a Vitamin C Serum for acne, you should begin by using the serum a little often than the 2 to 3 times a week in order to condition your skin to the vitamin C function. You need to start by washing your face using a gentle all natural cleanser and lukewarm water. After washing your face, pat dry with a towel and use a skin toner if necessary. Using a few drops of vitamin C serum, spread over your face and allow it to dry. Then follow by applying a good moisturizer. After a short period of time, if you have no irritation from using the vitamin C serum, you can increase the number of times you use it to the regular recommended number of times per week. Some people may have an allergic reaction to vitamin C.
Vitamin C may cause irritation especially with people who have sensitive skin. You should avoid Vitamin C serum after a dermabrasion, chemical peel, or laser treatment. Vitamin C serum that is not used by the due date or stored properly could hasten the signs of aging. When choosing a vitamin C serum that is good for acne prone skin, you should consider some important factors. First, only buy serum from a reputable company that has been in the market for some time and their products have been used and trusted by many users. Also, go for serums that contain natural and organic ingredients and are free of irritating chemicals which can further trigger inflammation in acne prone skin and make your skin condition even more difficult to deal with. 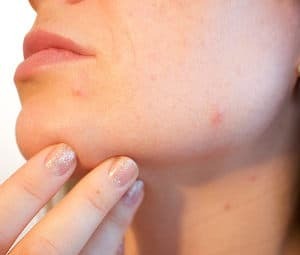 In some cases, the golden rule here is less is good because if there are a lot of ingredients, there is much bigger possibility that something may not be good for acne prone skin. Nevertheless, it always depends on the ingredients used. If you want to try out the most effective form of vitamin C, it is L-Ascorbic Acid but keep in mind that this vitamin C form oxidizes quicker than other more stable forms of vitamin C. Serums that are kept in opaque or dark glass bottles are better for preserving the content of vitamin C serum. Best Vitamin C Serum For Acne-Our Top Picks! Apart from Vitamin C, TruSkin Naturals Vitamin C Serum contains other good ingredients for acne which are botanical hyaluronic acid, vitamin E, organic aloe, witch hazel and organic jojoba oil. 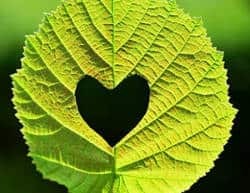 It is also free of irritating chemicals apart from phenoxyethanol which is usually contained in very small amounts in many serums in the market today as a preservative, and is considered safe when it is contained in those small amounts. 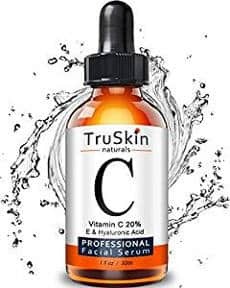 TruSkin Naturals Serum, which is one of the most popular vitamin C serums in the market today, is also recommended by the company for a more clear skin, less acne breakouts and smaller pores, and it comes with a 3 months full money back guarantee. 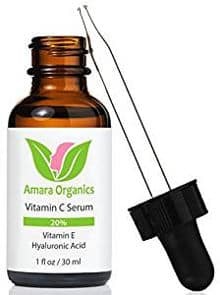 Amara Organics Vitamin C serum contains 20% vitamin C as well as many natural and organic ingredients including aloe, hyaluronic acid, vitamin E, witch hazel, organic jojoba oil and few other ingredients that the previous product in this review did not contain such as organic gotu kola extract, organic horsetail plant extract, geranium extract and dandelion extract. The only preservative used in this product is phenoxyethanol which, as we have said in the previous review as well, is considered to be safe when used in small amounts. When it comes to the users’ feedback relating to the effectiveness of this product for acne, there are many reviews from people saying that Amara Organics serum has worked for their acne breakouts and helped them to get a more clear and bright skin which feels hydrated and smooth. For more options, you can read our review on the best vitamin C serums. In conclusion, vitamin C serum is not only a good natural option for acne prone skin but it provides many other skin benefits as well which overall help acne inflamed skin.